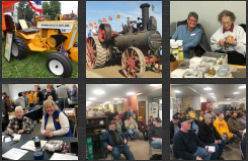 Minneapolis Moline Collectors, Inc. (MMCI) exists for the preservation and enjoyment of the products of Minneapolis-Moline, its predecessors and related companies, for the exchange of information concerning the same, and for the education of the public as to the historical nature and role of such products. Due to buyouts, bankruptcies, and mergers, many of the historical documents and knowledge of M-M have been lost. Many people, who were employees of the companies, dealers, and/or dealer employees, have considerable knowledge of the history of the company based on their experiences. In order to help fulfill the MMCI mission, the Club would like to capture this knowledge of company history. Yet many of these people are not known to the Club. Our goal is to find those who have this valuable historical information to preserve for future generations. Fill out the form below and provide us with some of the history we are searching for!